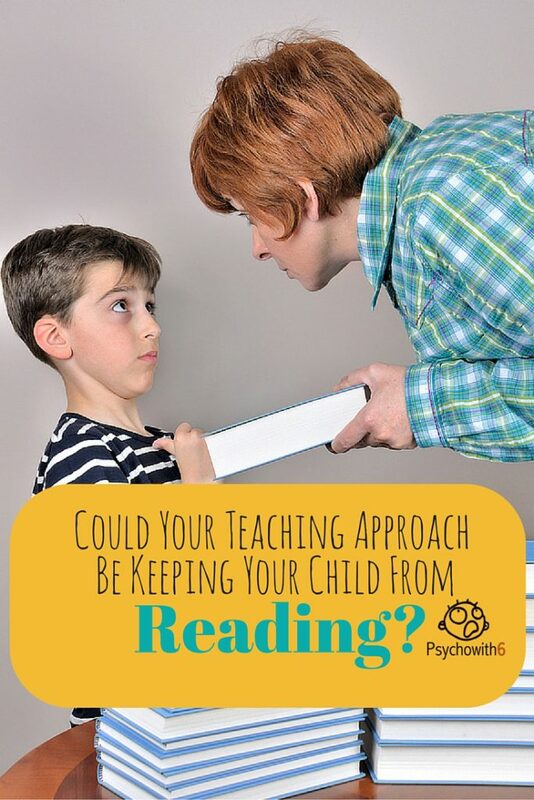 Could Your Teaching Approach Be Keeping Your Child From Reading? Reading is a vitally important skill for our children to develop. Because it is, we have to do what we can to make reading appealing. Research suggests that teaching approach has a powerful impact on children’s attitudes toward reading and the amount of time spent reading independently. Are you doing any of these things in your homeschool that could discourage your child from reading? Studies of kids whose academic progress is stunted in summers off from school suggest they are kids with the least number of books in the home. While I’ve never met a homeschooler who didn’t have a lot of books, I have known some who have very strict standards for literature. Of course we don’t want our children to read books that conflict with our values or that aren’t high quality. But limiting our children’s reading selection to the 1800s classics that you love may have the unwanted side effect of inciting rebellion in other areas. Our children have different personalities and preferences than we do. Refusing to allow them to choose books that appeal to their God-given passions may not only kill their desire to read, but may wound their spirits. Reading what you consider to be a silly book may bring a lot of joy to your child and may encourage him to read more serious works later. When my son was little, he was obsessed with dinosaurs. I found two dinosaur books at the time written from a Christian perspective. If I had limited his reading to those two books, he would have been extremely frustrated. Instead, we checked out every book we could find on dinosaurs from the library. We used the evolutionary statements in the books as opportunities to review what we know to be true–a teaching approach with proven effectiveness. One of the things I did this year in our literature co-op was allow each child to choose one classic book and one book of their choice for the group to read. Which books do you think the kids were most excited about? I want children to be exposed to classics, but when they beg me to let them read another excellent book in a contemporary series, why would I ever say no? Freedom of reading choice (within reasonable limits) encourages children to read. Reading is intrinsically rewarding when a child is able to read with adequate speed and comprehension (I have upcoming posts on these topics). But we can make reading a chore when we always tack on assignments. Book reports, chapter summaries, and writing definitions for vocabulary words are excellent means of developing particular skills. Unfortunately, they are terrible ways of encouraging children to read. Few children find these assignments fun. Would you want to read if you had to do these tasks for every book? In math the expression “drill and kill” refers to the practice of requiring students to complete pages and pages of problems, with the end result of killing joy for math. We can drill and kill in language arts as well. Elementary students should primarily be focused on discovering the joy of reading, rather than on developing technical skills. Assignments that are given should be short and purposeful. Once the kids in our literature co-op had practiced completing a literature map for books several times, I stopped requiring it. They understood literary terms and enjoyed using them in our discussions without the busy work. Reading without having to produce extra work encourages children to read. A new program in some public schools called Stop, Drop and Read is having a great deal of success in promoting independent reading. Freedom of reading choice and not requiring additional assignments have likely made it effective. But I would argue that the most powerful part of the program is the dedicated time for reading. Today’s schedules that are packed with extra-curricular activities and online access have made reading a luxury few think they can afford. Many of my adult friends tell me they simply don’t have time to read. How will we prepare our children to be readers in the future if we don’t create a space in our lives for books? Reading for enjoyment (the most powerful predictor of academic and life success) can easily be neglected in lieu of more “serious” schoolwork. Even reading aloud as families (which is my favorite part of homeschooling) should not be undertaken at the expense of time for your child to read on her own. Our family encourages reading before bed, but sometimes we stop, drop, and read too. What’s critically important is that parents participate. The modeling speaks volumes, to use a reading metaphor. If we are too busy to read for pleasure, how can we expect our children to take the time? Put a free reading time on your calendar or add it to your child’s lesson plan. I have found that adding reading time to the other, less desirable assignments encourages reading. It’s the first subject my kids complete for the quarter. Making dedicated time for reading encourages children to read. Just as children are unique in their reading interests, they are unique in their preferred format. Failing to provide support will keep our kids from reading. As a busy homeschooling mom, I can relate to wanting a child, who knows how to read, to read independently. But some children need you or another mature reader with them while they read out loud for emotional or decoding support. If your child hates to mispronounce or misread a word, he will be reluctant to pick up a book on his own until he is more confident. This child will need lots of encouragement and reminders that any mistakes he makes will be corrected as he reads more. It’s worth it to spend the time building this type of reader up. Reading and discussing in a group can also provide the support your child needs to read more. I’ve already mentioned that my kids read for a literature class in our co-op. It works so well to get kids reading. The kids ask each other how far they are in the book. But consider another option that I am considering for this year: start a book club. The book 100 Books for Girls to Grow On describes the benefits of reading books for tween girls in a mother-daughter book club. You could start a mother-son or a father-son or a grandparent-grandchild book club with any age child and build readers while you’re building relationships. Some children with dyslexia find the process of reading printed materials exhausting and need a different kind of support. These readers can benefit from listening to audio books for fun. Another option is to have your struggling reader listen to books while they read the text. Disney Story Central, Epic Books, and Amazon’s Immersion Reading titles have this reading support built in. Our digital-native children may feel more comfortable reading on a Kindle than printed books. Borrow a friend’s Kindle for your child to try and see what she thinks. Less confident readers may also be very sensitive to the format of the words on a page. Graphic novels that look like comic books are very successful in pulling these types of readers in. Capstone Publishers produce fiction and nonfiction titles on high-interest topics that are for lower-level readers. There are captivating pictures and lots of white space to encourage aspiring readers. You can find their books at your public library. Providing books in your child’s preferred format encourages children to read. A child who hates to read is usually a child who feels he isn’t good at it. If you haven’t had your child’s vision, hearing, or reading skills evaluated, I recommend it. Homeschoolers are understandably concerned about admitting to those outside the homeschooling community that our child isn’t reading well. But there are professionals–even those associated with public schools–who can be of great help. Every situation is unique, however, so my advice is to contact someone in a local or state homeschool support group for advice. You may have a reading specialist who now homeschools in your group! You won’t know until you ask. I also recommend the blog Homeschooling With Dyslexia. When my child was struggling to read, I discussed it with my neighbor–a teacher and reading specialist. Her advice made all the difference! I’ll be sharing about our experience later this week. Getting outside help for struggling readers encourages them to read. If you aren’t a reader or your spouse isn’t, it can be easy to communicate that you don’t expect your child to be an avid reader. Homeschooling can reverse the no-reading habit for you and your child. Remember that being a reader isn’t limited to reading War and Peace for fun. Reading is important and enjoyable for all kinds of kids, whether they want to enter a profession or a trade. Reading isn’t for “smart kids.” Reading is what makes kids smart. We shouldn’t automatically assume that dyslexic kids won’t be readers, either. Kids with learning disabilities can be the most passionate readers of all, because they have had to work for their skills. I know people who aren’t readers, but who love God’s Word. If for no other reason than you want your child to enjoy a close, wonderful relationship with the Lord, expect that your child will be a reader. Children always want to meet the expectations of a loving parent. Pray that God would give you wisdom and direction as you seek to raise a reader. Expect your child to be a reader to encourage her to read. If you have already made some of these mistakes with your child, and it’s appropriate, apologize. One of the most valuable lessons we can teach our children is how to admit when we are wrong. Taking the blame has the added benefit of encouraging your child to believe that he CAN be an avid reader and that it isn’t his fault. Explain that it’s something you will work on together and with God’s help, you will succeed. 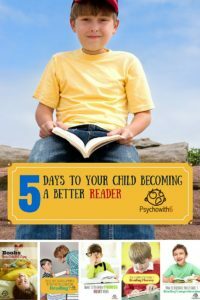 Be sure to read the other posts in the 5 Days to Your Child Becoming a Better Reader series!